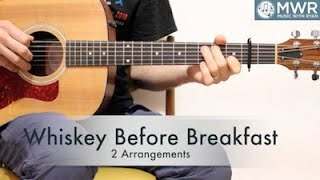 Here are my two arrangements for the tune "Whiskey Before Breakfast." I do this standard in the key of D but I like using the capo and working out of C position. This is a great beginning to an intermediate arrangement, although, I would say it lies closer to intermediate with all the hammer-ons and pull-offs I use. It helps makes this piece sound very connected and flowing. The B part is kind of tricky with all the consecutive eighth notes but I feel there comes a time when everyone must learn how to pick this tune!